The Dog Watch Cafe, at the far end of Water Street, is somewhat away from the hub of the Borough of Stonington. But the bar, known as the Dog Pound, is the nicest one I’ve been to in the town. That’s not a knock against the excellent Water Street Cafe, which will be reviewed at another time. 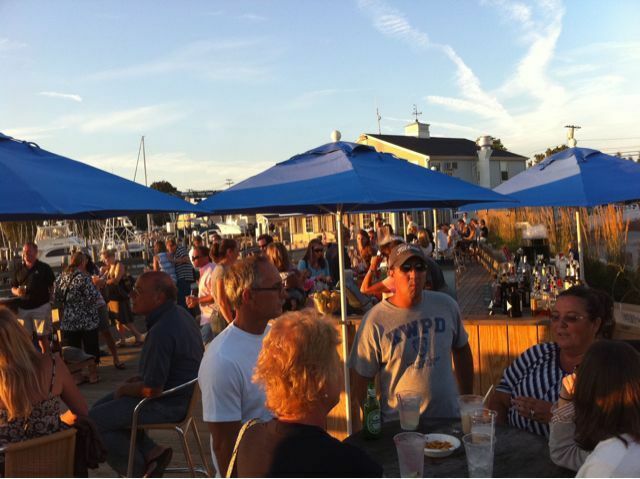 It is simply an acknowledgement that the Dog Pound sits on a pier overlooking the harbor, and even on a Saturday night in the heart of summer it is not overrun, a la the Boat Basin Cafe in NYC. In fact, this is the place the Boat Basin aspires to be. 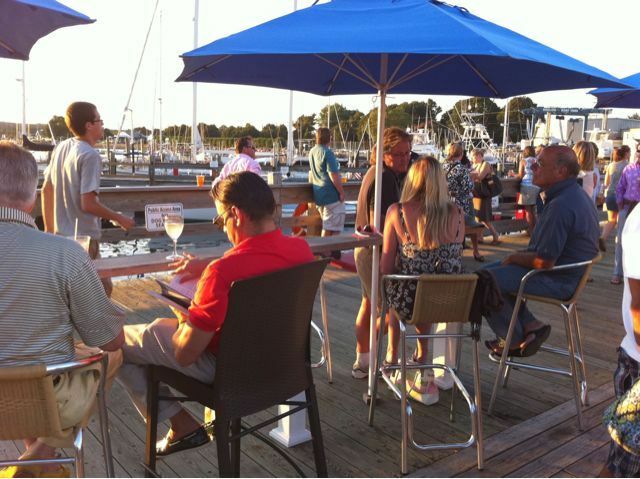 The pier is long and narrow, and the owners have intelligently placed a bar smack dab in the middle of it. 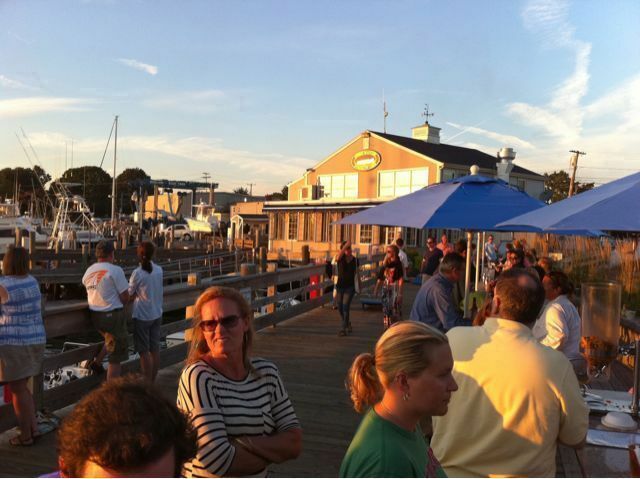 The pier is actually behind the bustling cafe, which sells New England pub fare. The pier is divided into lanes, most of which is public, the rest, tucked behind a narrow counter, is theoretically the Pound. 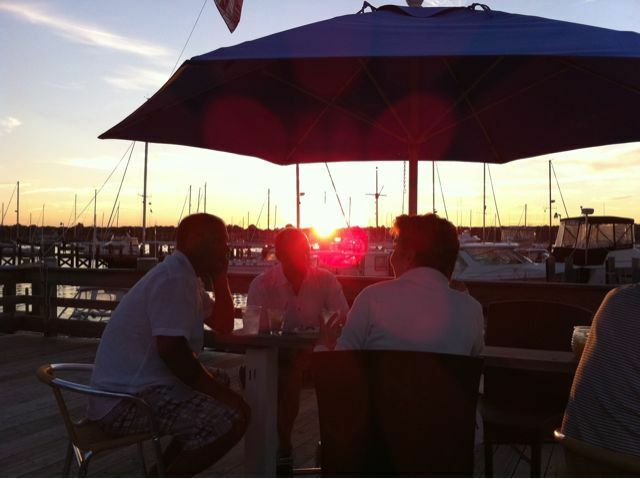 It is a fantastic place to drink a martini and watch the sunset, which dips behind the boats rolling gently in the harbor. The place is quite popular, and at first getting a seat was a bit of a challenge. However, the waitress is constantly calling couples to be seated in the cafe, squaring that problem away. That said, arriving at 7:30 on a Saturday night, I was told it would be 90 minutes for a table for two. She wasn’t kidding. 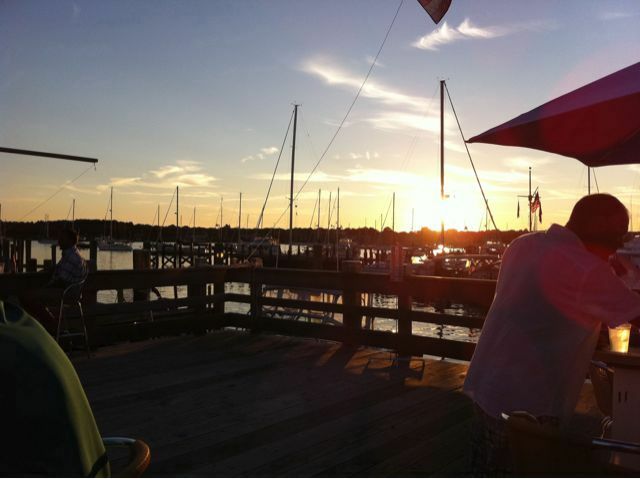 The sunset was great, the martini cold, and I switched to a delightful Mystic Island IPA. The people were friendly and we discussed whether it was Venus or Mars glowing so brightly in the evening sky. Finally though I was brought to a table inside the cafe for dinner. The fried clam appetizer (whole bellies, and I didn’t see them on the menu though the place is known for them) was excellent. The clams were succulent beneath the crunchy, salty coating. However, the seared tuna, touted on the menu as “the best in America,” isn’t even the best in Stonington (Water Street Cafe’s is excellent). It is, however, large enough of a portion to club your enemies into submission with. They prepare it with a faint coating of the same batter that adorns the clams, and run thick white, wasabi-infused sauce in narrow jets across it, though it sits atop some lo mein-style noodles and also gets served with soy sauce, if you want it. The tuna is tasty, the portion voluminous, but it’s handled in more if a TGI Friday’s fashion than not. We also sampled the mussels, which I think was the better of the two entrees. The mussels themselves were on the smaller side, which frankly sometimes I prefer, as when mussels come too large they can offer too much of a fight. Again, it was a copious portion, served in butter and garlic sauce. Next time, I’ll stick with the clams, or aim for the burger. The bar is the winner, though.